A Horse Racing Track for Maidens! A Free Horse Racing System for your favorite horse racing track! I've been spending more and more time making attempts to break down some excellent percentage tips rather than actually trying to develop a new horse racing system within the percentages. 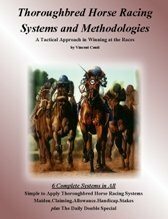 Well, as some of you already know, the six winning systems in my book are unique tactical methods encapsulated with handicapping statistics and percentages. I wanted to establish a new winning system using a different type of mathematical assignment. Basically, I am thinking "outside the box" for this new system. I have been tracking the results for this particular horse racing system for almost a full year and I have come to the conclusion that the winning percentage(s) have maintained a high enough threshold. Horse racing handicappers trying to pick winners at his or her favorite horse racing track can now apply this proven method. Before explaining to you the simplicity of this system, I want to share with each you what has been entailed in tracking and reporting the historical data. My systems are usually 50% or better win percentage(s), but I felt this spot play can be handy when your up against a chaotic maiden race. For starters, this method was applied to every race type currently being run in the thoroughbred world. I apply the methodology to each race type and track the results separately for each race type. These results are not combined. A true win percentage cannot be calculated if the results are combined. This methodology was applied to all types of thoroughbred horse racing tracks and not limited to a specific few. I believe it is important to research and develop (R & D) across many different types of horse racing tracks. Afterall, we all have our favorites and, to be quite frank, they all have payouts and takeouts equally or better than the next track. This winning system works best with Maiden Races. Horses that were "system selected" who ended up running second and third were not calculated. Although there were quite a few place and show results. I am only interested in finding winners. Out of the 282 winners, the average win price was $14.00, however we did see streaks of chalk winners (favorites) and there were some "bomb" longshots hit ($76.00). But it all evened out from 4-1 odds to 6-1 odds on (aggregate) average (not bad!). Another interesting point to this system; numerous maiden races were loaded with "first-time starters" and we continued to see winners at different maiden race levels as we applied numerous horse racing tracks. As a handicapper, you know as well as I that the daily program lists an average of 3 or more maiden races per day (except when dark). Pick a horse racing track; Calder? Laurel? Aqueduct? Golden Gate? Charlestown? Now look at a daily program for each track and count the number of maiden races. A full program card, for the most part is 9 or 10 races and usually includes 2, 3 or more maiden races. Handicapping a maiden race can be difficult at times due to the lack of past performances, statistical data, and actual racing experience...or should I say racing inexperience. Let's get started; First, you will need the daily racing program in order to apply the winning system. The Daily Racing Form provides bettors the racing information required to select a horse. The Racing Form is the industries official database for racing information and is second to none in thoroughbred horse racing. It provides this data for any horse racing track in the country. NOTE:The Racing Form "booklet" and the Racing Form "newspaper" may have different charts. These power number symbols are found in the Daily Racing Program booklet found at casinos and horse parlors. Secretariat (L) CL PR SP PW Sires Fee 120 c50000 etc. because they can be powerful when analyzing a race with first-time starters. The power numbers are applied to every race at every thoroughbred horse racing track. My knowledge may be limited but I speak with many handicappers and these relative strength figures are usually disregarded. Maybe it's just another statistic added to a horses performance to further addle the minds of number crunchers and skew the computer software for handicap programs. However, when used alone and applied correctly these values do produce winners. take the highest two numbers and figure the difference between each. the top horse MUST be 7 points or greater with the horse that has the second highest score. If the point spread is 6 or less we cannot apply this system. Sounds simple enough to figure out. Afterall, the statistics of the overall win percentage was calculated over a ten month (updated quarterly) trial against ALL types of maiden races at numerous horse racing tracks, like it was explained earlier. Now I want to take it to the next step and show you an EXACTA tactic using the same figures. Races that produced numerical values within the 6 point spread were aborted for finding the sole winner, however the top two total values were used in an exacta box and produced a winning percentage of 35% in the 327 maiden races that were NOT applicable (as mentioned earlier also). Pricings were not calculated, as I did not deduce a percentage for the size of the exacta payoffs. My goal was to produce winners at any horse racing track, and using the existing data enabled the exacta selections. Here's another example of the power number system. Here we have Horse 2 totaling 58. Horse 9 has a power number of 56. The top two horses have power numbers of 58 and 56 which have a difference of only 2. A two point spread does NOT qualify for a winning angle. Again, the spread must be 7 or greater. Horse 2 and 9 DO QUALIFY for an exacta box. It is important to box the exacta when applying this spot play. A 35% chance to hit an exacta on a maiden race using my power number system can make you very good profits. Another angle to this horse racing system is to extend the power numbers further and differentiate the top THREE contenders for a possible trifecta wager, a three horse exacta box or to use the top three contenders in your multiple race wagering such as the pick 3, pick 4 or even the almighty pick 6 wager. Maiden races with 12 or more horses may reveal several power numbers in the "same range" making it difficult to pinpoint a selection. You will find 4 or 5 horses with totaling numbers in the forty's (46, 43, 43, 47, 42) and 4 or 5 horses with totaling numbers in the thirties as well. These results would not qualify for a winner or an exacta spot play. So there you have it. The Power Number system works great with Maiden Races and I truly hope this free system gets you into the Winner's Circle! For questions or comments regarding the Power Number system simply send an email. have been published in different formats. Many people have had problems using this system because their particular area does not carry the Daily Racing Form "Booklet" program. The DRF "newspaper" format does not provide the Numerical Assignments statistic. To the best of my knowledge, the program format in the booklet version is found at horse parlors, casinos and stores here in New York. How would you like SIX .. 6 Top Percentage Horse Racing systems. This book was in the TOP 10 Handicapping Items List of 2007 by Phillips Racing Newsletter! Thoroughbred Horse Racing Systems and Methodologies gives you 6 powerful horse racing systems. Each winning systen can be applied to any thoroughbred horse racing track in northern America. Each book costs only $24.95. That's only $4.00 a system. Free Shipping! DOWNLOADABLE version is available at Lulu ... guaranteed.